Ranbir Kapoor was born on 28th September 1982. He is the elder son of Rishi Kapoor and Neetu Singh. Ranbir studied in Bombay Scottish School in Mahim, Mumbai. Later, he went to The Lee Strasberg Theatre and Film Institute, New York to chase his dream of being an actor. Ranbir did not start his Bollywood career as an actor. Instead, he began as an assistant to director Sanjay Leela Bhansali. In the year 2005 when Bhansali was making his blockbuster Black, Ranbir worked closely alongside throughout the movie. 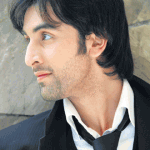 Later in November 2007, Ranbir teamed up with debutant Sonam Kapoor and made his own acting debut Saawariya. The movie was yet another dream project of director Bhansali. The film failed in the box office. However, Ranbir did not disappoint his Kapoor gene. He dazzled with his acting talent and received appreciation of the industry. Ranbor’s next venture was Bachna Ae Haseeno in the year 2008, alongside Bipasha Basu, Minisha Lamba and Deepika Padukone. Unlike the much hyped Saawariya this musical comedy did fairly well in the box office. Once again Ranbir’s performance stood out and the industry looked forward to yet another Kapoor to rule Bollywood. Rabir gained his true fame from Wake Up Sid. The movie was released in 2009 and directed by the young debutant director Ayan Mukherjee. Ranbir played the character of Siddharth Mehra in this film. With the acting talent and raw, urban, good looks he breathed life into the spoilt and selfish college student. Wake up Sid was critically acclaimed and received many nominations at different award ceremonies. His next project was the biggest stepping stone of his career. This time Ranbir teamed up for the first time with Katrina Kaif and starred in the musical comedy Ajab Prem Ki Ghazab Kahani. The movie turned out to be one of the biggest hit of the year. Ranbir radiated as Rocket Singh. Prakash Jha’s Rajneeti was released in the year of 2010. It was multi-starrer movie and Rabir shared screen with Bollywwod biggies like Nana Patekar, Ajay Devgan and Manoj Bajpai. Prakash Jha had cleverly combined Indian epic Mahabharata and Mario Puzzo’s Godfather. Rabir played the character of an NRI in this film. Audience applauded at his performance and yet again he proved himself to be a true actor. Even the harshest critics accepted him to be a natural actor. After the consecutive successes, everyone awaited his next release Anjaana Anjaani with intense eagerness. However, despite the natural performance of both Rabir Kapoor and co-star Pritanka Chopra, the film did not do well in the box office. Imtiaz Ali’s Rockstar released in 2011’s 11th November. The movie was a complex project. Yet, he had done justice to the character of Janardan. With sheer acting talent Ranbir showed the rage and the pain the charcter went through. The movie received multiple award nominations in almost all the award ceremonies and Ranbir walked away with the best actor awards. Television had been a vibrant part of Ranbir’s life. He had co hosted Film Fare award with Imran Khan. He was the youngest actor to host the award ceremony. Like his career Ranbir’s personal life is also very colorful. His name had been involved with many female actors. Unlike other actors of the industry, he never tried to hide his affair and maintained a candid attitude with the media. Presently, he lives with his parents in Mumbai. And when last heard he was still single. In this short time Ranbir received several awards and nominations. Ranbir had been nominated for Wake up Sid and Rajneeti. Undauntedly, Ranbir’s film career has been different from other star kids. He had done different kind of movies. He had dared to get involved with challenging projects. In his upcoming movie Barfee he played the role of a deaf man.